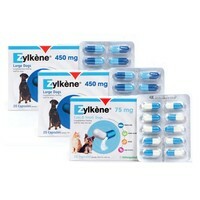 Zylkene for Cats and Dogs are natural pet de-stressing capsules to help manage stress in dogs. Dogs obviously cannot tell us how they are coping with stress, but they can alter their behaviour. Any alteration in normal behaviour patterns may demonstrate that your dog is unhappy and may be stressed. Zylkene can help. All pets can suffer from stress and it is often difficult to recognise that your pet is stressed, it may adopt a low posture and look agitated and more excitable than normal. However, sometimes the signs are more subtle and trickier to spot. Your dog may be reluctant to go to certain places, toilet training may breakdown - perhaps going indoors, it may start grooming excessively or vocalise. Zylkene can help with these periods of stress either on a short term basis or longer term as required. Behaviour modification techniques and toys can also help your pet to deal with stress – ask your vet or behaviourist for further advice. I have a very skittish cat who is scared of his own shadow at times but it is currently our youngest cat that scares the life out of him for no apparent reason except he doesn't like change. I gave him a single dose of Zylkene this morning and tonight he was back to his old self. I can't think of anything that calms quite like this product and I've been using it for years. Zylkene is an excellent product. I give it to my cats when travelling in the car and also when I introduced a kitten to my adult cats. It does not make them sleepy, it just helps them to feel calm and secure. It can be given by mouth or added to food. Sadly this had absolutely no effect on my nervous cat. Works like magic! I was sceptical about this product but the glowing reviews made me try it. We are in the process of moving house and one of our cats is very sensitive to change. He started being aggressive towards our dog (unusual behaviour for him) and was generally restless and unsettled. As soon as the capsules arrived I gave him the powder from one 75mg capsule mixed with a little Lik-e-lix and fed it to him from my finger. The reaction was almost instant! He immediately settled down and went to sleep, and was much calmer during the rest of the day. I have been giving the capsules for four days now and the difference in him is really noticeable. I can't praise this product highly enough. Two of my female cats have always been very nervous, one spent most of her days hiding outside and did not feel safe in the house, I believe she felt trapped. The vet recommend Zylkene and both cats have improved, in fact the cat who was afraid of the house now spends most of her time inside, even when we have guests (after the first initial flight reaction to the door bell). They have really made her life more relaxed; she will never be a lap cat and is still scared of her own shadow, but calms down a lot quicker than previously. I give them both one a day and I have recommend friends with very nervous pets to try them for a few weeks to see if they can help. Zylkene is a wonderful product and I highly recommend it. My sibling cats were very neurotic and stressed, hated visitors, would spend days hiding in wardrobes and drawers, and began fighting aggressively. I contacted Cats Protection, where I adopted them, and asked for advice. Zylkene was suggested, otherwise I would have to rehome one of my cats. I am delighted to say I have two happy cats who no longer hide, accept visitors, sit on my lap, share the same bed and, apart from the occasional game of "tig" get on wonderfully. Needless to say I am delighted and the cost on Vetuk is substantially cheaper than the vet. First used Zylkene when Millie went to have radio-iodine therapy for her thyroid problem. She was quite chilled out at going to the clinic for 2 weeks. Now she is a "senior" cat and some new cats have moved into the neighbourhood, she was apprehensive about going out. Zylkene has come to the rescue again, and Millie is once again quite laid-back about life, except for Sid (my mother in laws cat), she still wants to chase him out of our garden!!! We had changes in our family and our eldest cat got stressed. Our veterinarian recommended Zylkene for him. After one week it was easy to see the change in his behaviour and after two more weeks he was back to normal! We continue giving one Zylkene capsule per day to him. What a great way to help your cat without any harm or side effects what so ever. One of my cats became highly stressed last year due to changes in our neighbourhood. He developed cystitis, he overgroomed and excessively scratched at himself resulting in skin infections. He also started spraying in the house. We had many trips to the vets to treat the symptoms but I had to do something to prevent this from recurring as he is highly strung anyway. My vet prescribed this product, it seemed to help so I wanted to carry on with it but it was so expensive from them. I'm a regular customer of VetUK and I was delighted to find it here at a much better price. I mix the contents of one capsule in his breakfast every day and he doesn't notice. My vet told me it is safe to use long term and is a natural supplement. My cat is now healthy, has ceased his stressed behaviour and is much calmer. Many thanks! I bought these for my very nervous tabby cat. He just about allows you to touch him and definately not a lap cat. After being on these tablets for a week he attempted to sit beside me and let me stroke him, after another week he sat on our laps. Definately worth the money and I am very glad I tried these tablets for him. Along with the Feliway diffuser we now have a very happy cat. We bought this for a very nervous cat who was frightened of people. Reggie spent his first few weeks with us under a chest of drawers. I put out a very small portion of meaty food with this sprinkled on top once a day and he quickly got used to it. It really helped him. He'll never be a lap cat but now he's happy to be indoors and will come when he's called. I'd recommend this to anyone with an overly nervous cat, it does work. These have helped our little puppy and I would recommend them. Used as a one-off for my Cavalier King Charles Spaniel when visiting my sister for a week - he doesn't like other dogs and she has 5. For the first time ever he was relaxed at her place and wagging his tail all the time - a result we had not got with any other anti-stress solutions used previously. My cat Suzy was extremely nervous and easily frightened. Since giving her Zylkene she is so much better! She is very relaxed and so much happier. She is always singing now! So I am very glad I started giving Zylkene and highly recommend it. Our long haired female cat was stress grooming after the introduction of two kittens to the house. She was being aggressive towards them and vomiting fur balls daily. After 3 days of being on Zylkene she snuggled up to one of the youngsters and went to sleep. It has been 10 days now and we have had no vomiting and she is less aggressive towards the youngsters. I think it really has worked, she is happier and her coat is already looking better. The capsule contents are easily hidden in a very small amount of tuna and she isn't any the wiser.